Recognising new approaches to improving mining productivity and sustainability outcomes post the recent ‘mining boom’. Australia 3.0 Mining had a good turnout (over 70) and a busy program (over 20 speakers) with active interaction in the Q&A sessions and the networking during the breaks. Colin Farrelly as Mining Lead presented the wrap up plenary and thanked the Keynote speakers, who helped us set the scene for mining innovation both now and into the future. shaping some into ideas suitable for collaborative research for the innovation pipelines of both AMIRA International and SA Gov Mining and Petroleum Services CoE. This year Australia 3.0 Challenged participants to…identify new ideas and solutions for success in exploration, development and mining with improved productivity and sustainability outcomes …and galvanising the action to make them real. It’s NOT a talk-fest, it’s a do-fest! Australia 3.0 is an opportunity for you to share your own ideas and opinions, and contribute your experience to mature the ideas of others into a new and innovative pathway. Catalysing ideas into the future. It is a national forum for the innovators in your team. The Australian mining industry faces significant challenges over productivity and sustainability. Decreasing ore grades, deeper mines, higher input costs and complex regulation have all contributed to declining productivity reducing our global competitive advantage. To ensure economic prosperity for Australia, our mining companies, service providers, government departments and research organisations need to collaborate in an open and effective way to develop new ideas and new solutions to address these challenges. Technology enabled transformation can shift operations from a set of static disparate functions, to a digitally aware, dynamic, automated, integrated and interactive environment, with increased agility, lower operating costs, higher productivity and improved safety and environmental outcomes. You, and other leading industry thinkers will put these ideas through their paces, test and mature them, and identify the research projects required to bridge the gap between ideas and broad industry uptake. Day two the gathered experts will socialise and finalise the scope of potential research proposals ready for input the to funded pipeline process of our industry research partners: AMIRA and the Sth Aust Govt Mining and Petroleum Services Centre of Excellence. The call for Emerging and Cross-Industry Information and Communication Technology (ICT) for Transforming Mining was held earlier in August and now they are under review. 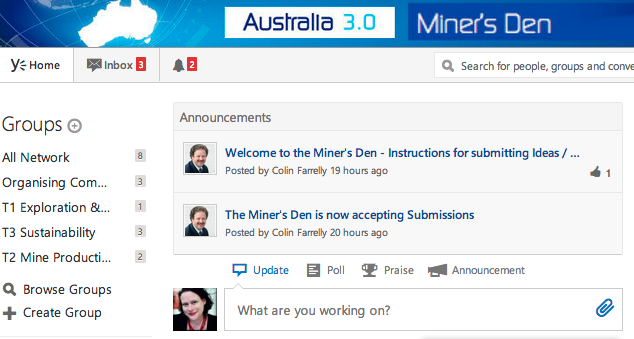 The A3.0 Miner’s Den has been set up under the management of AMIRA International for the purposes of having discussions around ideas and solutions as part of the Australia 3.0 Mining Stream. Using the Yammer on-line collaborative network for sharing innovative ideas and solutions for the mining industry where Information and Communications Technology (ICT) is a disruptive enabler for change. We welcome the Prospectors to the Den and we will also be bringing Miners and Technology innovations specialists for helping develop ideas. Some of these will be showcased at the A3.0 Mining stream on 28 August. Government of South Australia Department of State Development is home to a project exploring how to establish Adelaide as a national Information and Communications Technology (ICT) hub to service the mineral and energy resources sector with cutting-edge ICT solutions. The ICT Roadmap for Minerals and Energy Resources Project, the outcomes of which are being implemented through the new Mining and Petroleum Services Center of Excellence, aims to support one of the South Australian Government’s Seven Key Priorities: Realising the benefits of the mining boom for all. The new Department of State Development is supporting Australia 3.0 as a means to generate new opportunities in support of this objective. AMIRA International Ltd is a member-based organisation of minerals companies and suppliers that develops, brokers and facilitates collaborative research projects. Through this process a number of companies can jointly fund research and jointly share the benefits. AMIRA will be actively seeking ideas from the Australia 3.0 event for seeding new collaborative innovation projects for their mining company members. CSIRO Minerals Down Under Flagship works across the minerals value chain to grow Australia’s resource base, increase the productivity of the minerals industry and reduce its environmental footprint, both in Australia and globally. The Minerals Down Under Flagship been an active supporter of Australia 3.0 for the last three years and this year will be actively engaged in supporting the Showcase for new ideas and new solutions. In 2013 from May-August Mining Stream Leader, Colin Farrelly worked with Mining Stream Speakers, Jonathan Law, Paul Heithersay and Paul Lucey to prepare for the 8 August Australia 3.0 Forum. Below are the presentations and papers that were part of the breakout sessions that all contributed to the final Australia 3.0 Mining Communique.